The Mercedes CLA-Class is one of Mercedes’ baby models, having only been around since 2013. The compact four-door luxury sedan immediately became one of the company’s most popular models, selling over 100,000 units in just it first year. Mercedes even called it its “best launch in 20 years,” which is no small feat considering the multitude of successful models the company has released in that time. Not surprisingly, the success of the CLA gave Mercedes the idea of expanding the family to include the CLA Shooting Brake. So, here we are. Launched at the 2014 Los Angeles Auto Show, the CLA Shooting Brake was presented as a solution for customers in the market for an entry-level luxury wagon. It currently sits just below 2015 Mercedes-Benz CLS Shooting Brake, but carries with it a lot of the design elements from the 2014-2015 Mercedes-Benz CLA Coupe. 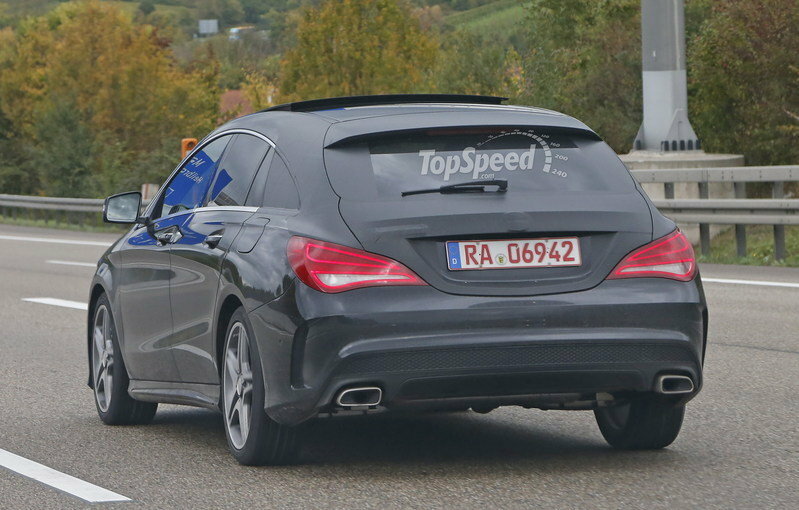 On its face, the CLA Shooting Brake shows a lot of promise. It has the trademark Mercedes engineering on its side and more importantly, it’s priced reasonably enough to make it affordable even for those who would’ve been priced out by the CLS Shooting Brake. But other than style and pricing, is the CLA Shooting Brake really good enough to warrant a purchase? Or is it simply a premature expansion of a new model that might have been better off sticking to what it was in the beginning? 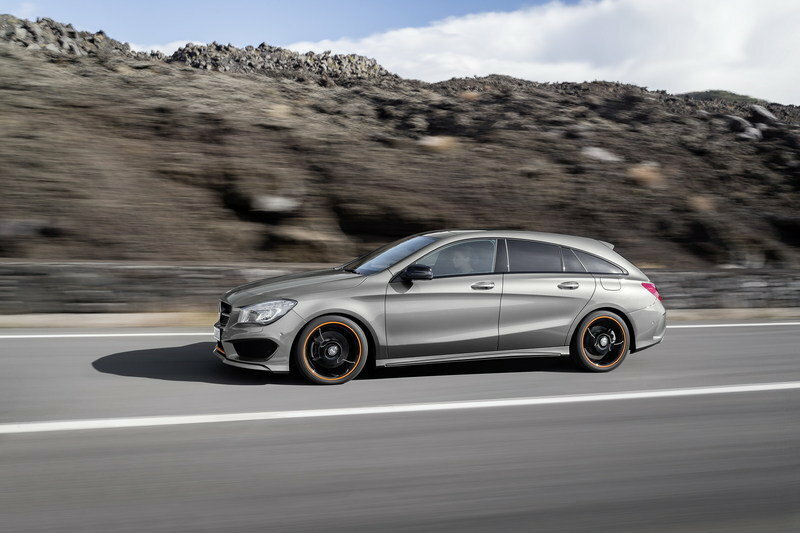 Continue reading to learn more about the Mercedes-Benz CLA Shooting Brake. At the very least, it’s more proportioned than the four-door CLA Coupe ever was. The CLA Shooting Brake gets rid of all the pretentiousness with a profile that justifies its shooting brake - or wagon, in common speak - classification. The longer roof does most of the trick, but the flashy front profile and the aggressive body lines also adds some flair to the CLA Shooting Brake, preventing it from become another dreary-looking wagon with the personality of an Evander Holyfield cardboard cut-out. There’s enough of those in the world already. That said, the CLA’s rear roofline does look a little swollen, and for all the touting of this being one of the longest wagons in the market, it didn’t do much in helping add more cargo space. Still, it has and identity of its own, which is more than what you can say for other models of its ilk. For better or worse, the interior of the CLA Shooting Brake feels like a world unto its own. While it does carry over the dashboard design from the CLA Coupe, Mercedes apparently spent little to no time simplifying the dizzying number of buttons, switches, and controls on the cabin. It might be aesthetically pleasing, particularly if images of a plane’s cockpit enters your head, but it’s not that convenient for a driver. Even the floating screen looks a little out of place and, dare I say, a little “aftermarket-ish.” Again, that’s not necessarily a bad thing, but we expected more from Mercedes. Adding to the operational trickery is the placement of the command toggle at the transmission tunnel. As if navigating around the myriad of buttons on the flat-bottom steering wheel and the console just below the turbine-inspired A/C vents is hard enough, Mercedes had to place the command toggle of the screen separate from the rest. Last I checked, we can only use two hands for driving, right? Confusion aside, I do like the sporty front seats, which aren’t what you’d normally find in a station wagon. It’s probably one of the best things about the CLA Shooting Brake’s interior because it accomplishes two things: bring a racy element to the cabin while also providing reasonable comfort for both the driver and the front passenger. This brings us to the rear seating accommodations, one of the biggest flaws of the CLA Coupe. Sadly, Mercedes didn’t do too much to improve the legroom at the back. The more upright roofline does add almost 1.6 inches of space, but it’s still not enough to completely make it a comfortable riding experience. Even with the seats in place and the better proportions, cargo space tops out at just 495 litres, 25 liters more than the CLA Coupe. The solution to this, as this case with most wagons, is to flatten the rear seats altogether. When that happens, cargo space improves to 1,354 litres, good enough for a wagon but still falls short of a car like the Volkswagen Golf Estate, which has 1,620 liters of cargo space at its disposal. 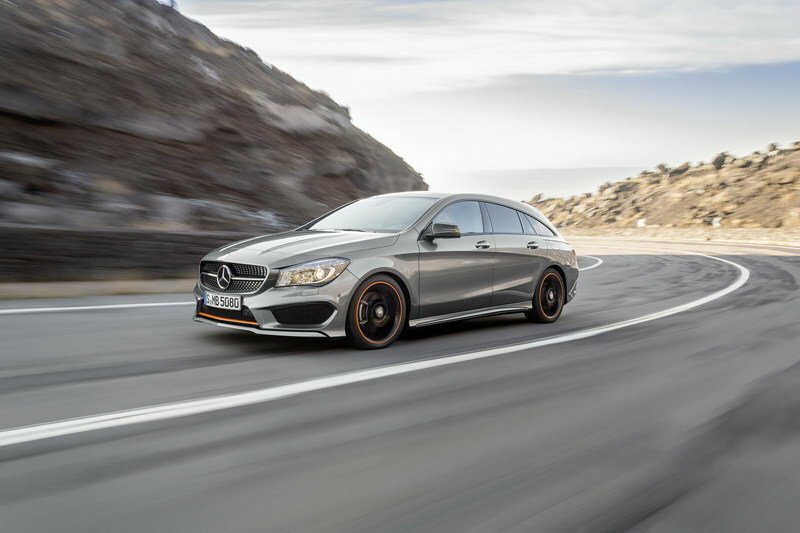 The Mercedes CLA Shooting Brake is being offered with three different engine options, each coming with its own set of advantages and disadvantages. First up is the 2.1-liter, inline-four turbo diesel that powers both the 200 CDI and the 220 CDI. Output figures for both engines come up to 136 horsepower and 221 pound-feet of torque and 177 horsepower and 258 pound-feet of torque. Both models are fitted with seven-speed DCT dual-clutch transmissions, which sends power to the two front wheels. With that, the 200 CDI is capable of sprinting from 0 to 62 mph in 9.9 seconds to go with a top speed of 133 mph. Those are respectable numbers but if you’re choosing between one of the two, the 220 CDI gets to the same 62-mph speed in just 8.3 seconds and has a top speed of 141 mph. Moving on to the gasoline engines, we have a 1.6-liter turbocharged, four-cylinder engine that powers the CLA 180 and CLA 200. Just like their diesel counterparts, the CLA 180 only has 122 horsepower and 147 pound-feet of torque on tap, much lower than the CLA 200 and its 156-horsepower and 184-pound-feet of torque figures. 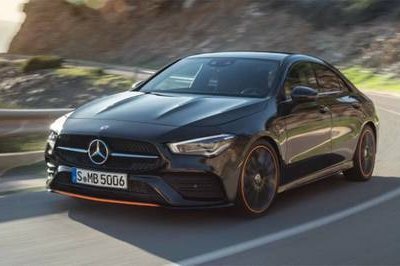 There’s also a significant gap in performance figures as the 180 can only sprint from 0 to 62 mph in 9.4 seconds, six-tenths-of-a second slower than the CLA 200. It’s the same story with top speed. While the CLA 180 can top out at 130 mph, the CLA 200 can go higher at 139 mph. Finally, we move to the range-topping trims: the CLA 250 and the CLA 250 4MATIC., It’s actually just the same car in terms of the engine (a 2.0-liter turbo four), output (211 horsepower and 258 pound-feet of torque), and performance ( top speed of 149 mph). 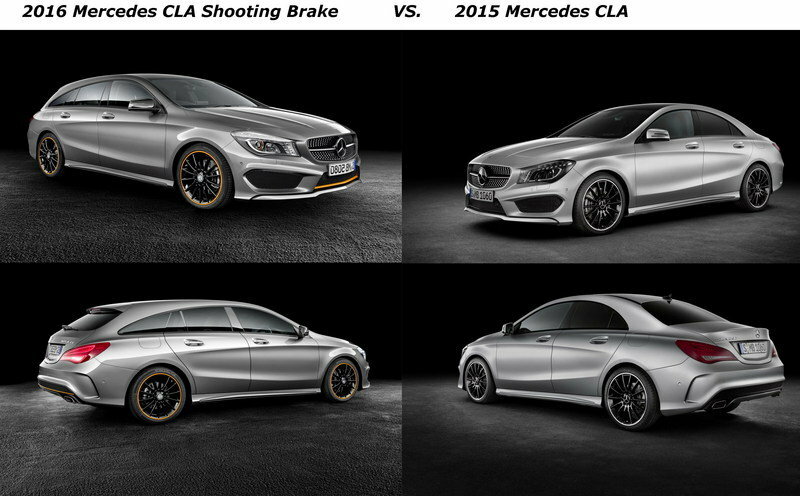 The only difference between the two is that the CLA 250 4MATIC can sprint from 0 to 62 mph in 6.8 seconds, a tenth-of-a-second faster than the CLA 250. That’s partly due to the former being the only CLA Shooting Brake that runs on all four wheels instead of just the two front wheels. If you want to go all-out, there is also a 2016 Mercedes-Benz CLA 45 AMG Shooting Brake version, whose turbocharged, 2.0-liter, four-cylinder outputs 381 horsepower and can hit 62 mph in just 4.3 seconds. Of all the things that’s been said about the Mercedes CLA Shooting Brake, this one is arguably the most important: it’s not available in the US. That’s because the growing popularity of crossovers and SUVs have basically created a shift in the perception of what an ideal people-mover is for most American families. Wagons, especially of the premium variety, aren’t as important as they were in the past. For its part, Mercedes already has the E-Class in the US filling the wagon slot so the higher-ups in Germany probably thought that it wouldn’t make sense to have two wagons in the mix, even if both models are reasonably apart from each other in Merc’s lineup. In any case, pricing for the CLA Shooting Brake starts at £26,030 in the UK. By default, the Mercedes CLA Shooting Brake’s absence in the US means one less competitor for the Volvo V60, arguably the closest thing you’ll find in our neck of the woods to the CLA wagon. If you look at it from another perspective, though, it’s probably a good thing that the CLA Shooting Brake isn’t here because it’s going to have its hands full against the V60. 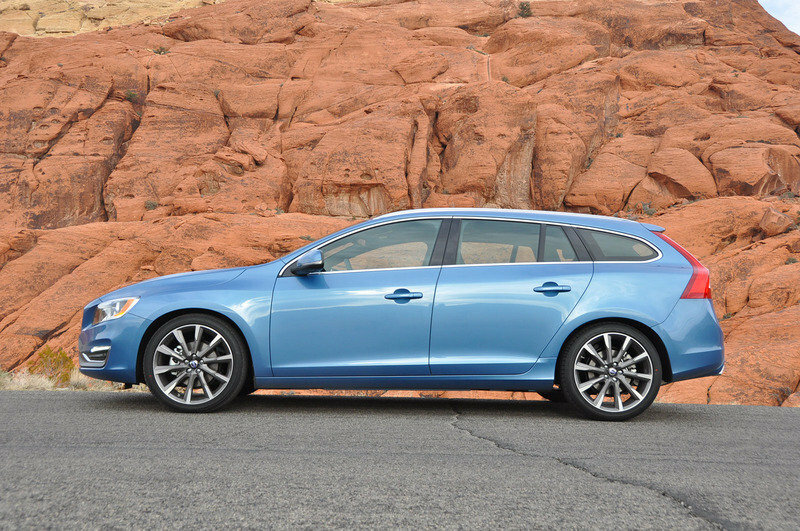 By and large, the V60 is considered one of the best wagons in the market. Say what you will about Volvo’s seeming lack of panache, but it knows how to make wagons. The V60 itself seamlessly blends a mixture of luxury and functionality. The interior, for example, may be too simplistic compared to the CLA Shooting Brake, but there’s still enough high-quality materials and stylish amenities to make for a seamless and comfortable ride. 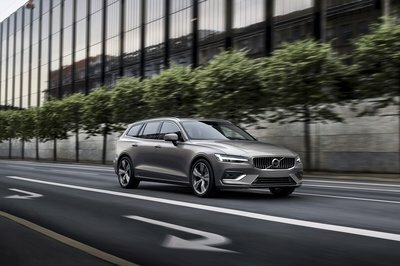 Three different engines are available for the V60, beginning with the base, turbocharged, 2.0-liter that produces 240 horsepower and 258 pound-feet of torque. This Drive-E engine is mated to an eight-speed automatic transmission. A little north of that is the traditional five-cylinder that’s rated at 250 horsepower and 266 pound-feet of torque with a six-speed automatic and an all-wheel-drive system. Finally, the 3.0-liter six-cylinder sits at the top of the range, sending 325 horses and 354 pound-feet of torque to all four wheels courtesy of a six-speed auto transmission. The only drawback to the V60 is the lack of a diesel option, but with a base price of just $35,750, I’m sure people won’t mind too much with what they have to pay for the model relative to the market. It’s a shame that the Mercedes CLA-Class Shooting Brake isn’t available in the US because I actually think it’s going to do well in this market. But as it is, Mercedes doesn’t appear to be changing its stance on that anytime soon. Still, the CLA Shooting Brake has a lot of potential, if you know what you’re looking for in a wagon. It fits the perfect profile of a wagon and it stands out quite a bit in the open road, a testament to the design genius of Mercedes. The interior is a mixed bag go awesomeness and disappointment, but if you can take one with the other, I don’t see any reason why it should be a deal-breaker. Likewise, the engine options offer enough variety to suit a customer’s gas-guzzling preference. All in all, the CLA Shooting Brake should be worth its price tag. Now if only there was a way for American customers to get their hands on one. A change of mind from Mercedes, perhaps? Breathtakingly sporty proportions and a powerfully dynamic design idiom with sensuously shaped surfaces already made the CLA unmistakable in its four-door Coupé guise. It is now followed by a further design icon, the CLA Shooting Brake, with a unique look all of its own. The lower overall height and the elongated coupé-style roof contour line, the low greenhouse and the sweep of the high beltline are the key design features of its distinctive profile. As is the gentle downward slope of the roof line, which makes for significantly more headroom than in the four-door Coupé. The CLA Shooting Brake (length/width/height: 4630/1777/1435 mm) will initially be available with a choice of two diesel and three petrol engines as well as with 4MATIC all-wheel drive. It goes on sale in January 2015, with the first models going to customers towards the end of March 2015. 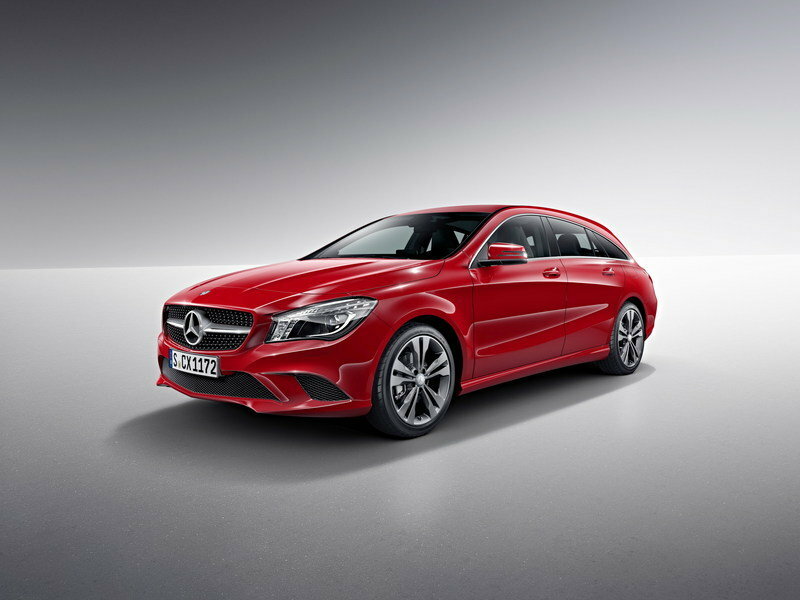 "The new CLA Shooting Brake is the latest member of our successful family of compact models. The range, which now includes five models, covers an extremely wide spectrum: with the spacious B-Class sports tourer, the youthfully dynamic A-Class, the avant-garde CLA-Class Coupé and the compact GLA-Class SUV, we cater for a host of different customer wishes in this segment," says Ola Källenius, Member of the Divisional Board Mercedes-Benz Cars, responsible for Marketing & Sales. "Like its big brother, the CLS Shooting Brake, the CLA Shooting Brake is targeted at active customers who are looking outside of the mainstream for a car that impresses with a high utility value." The guiding principle behind the designers’ work was that of sensual purity as an expression of modern luxury. "The new CLA Shooting Brake offers a contemporary interpretation of sensual purity and represents the perfect synthesis between the emotionality of a coupé and the intelligence of a shooting brake", explains Gorden Wagener, Head of Design at Daimler AG. "The styling of our CLA Shooting Brake is extremely progressive as well as unmistakable. Once again, we have created a whole new class of vehicle." The thrilling design details of the limited-edition OrangeArt Edition special model ensure that it brings an exciting note to the market launch. Orange highlight rings around the bi-xenon headlamps ensure that they stand out in spectacular style. The rim flanges of the AMG light-alloy wheels are painted in orange on the OrangeArt Edition. Orange/black sports seats and orange contrasting topstitching help to define the interior. The elegantly long drawn-out Shooting Brake tail end, in conjunction with the variability that this offers, guarantees exceptional recreational value without compromising on the CLA’s aspiration to represent design at its best. At the same time, headroom in the rear is significantly greater than in the four-door CLA. At 94.7 cm, the effective headroom in the rear is 4 cm higher than it is in the companion model. Access to the second row of seats is also much easier. This spaciousness is one of the strengths of the Shooting Brake. The load compartment offers a capacity that ranges from 495 to 1354 litres (when loaded up to the upper edge of the rear seat backrests or loaded to the roof with the rear bench seat folded down, respectively). If the rear seats are moved into the more steeply raked "cargo" position, the load capacity increases to 595 litres while still leaving space for five occupants. The width of the luggage compartment, at up to 1328 mm, is leading in this segment. Clever little details, including the magnetic catch on the through-loading flap in the rear-seat backrest for long items, such as skis, are further typical examples of this carefully thought-out concept. Options such as the electrically operated EASY-PACK tailgate or the Load Compartment package help to enhance convenience and variability when using the load compartment. Apart from the "cargo" positioning option for the rear-seat backrests, the Load Compartment package includes a collapsible box, a 12 V socket and an additional stowage net at the side of the load compartment. To add to the exclusive ambience, aluminium strips with anti-slip inlays are available as an option for the load compartment floor. With a Cd value of 0.22 in its BlueEFFICIENCY Edition guise, the four-door CLA sets a new benchmark – both within the Mercedes model portfolio and among all series-production vehicles. 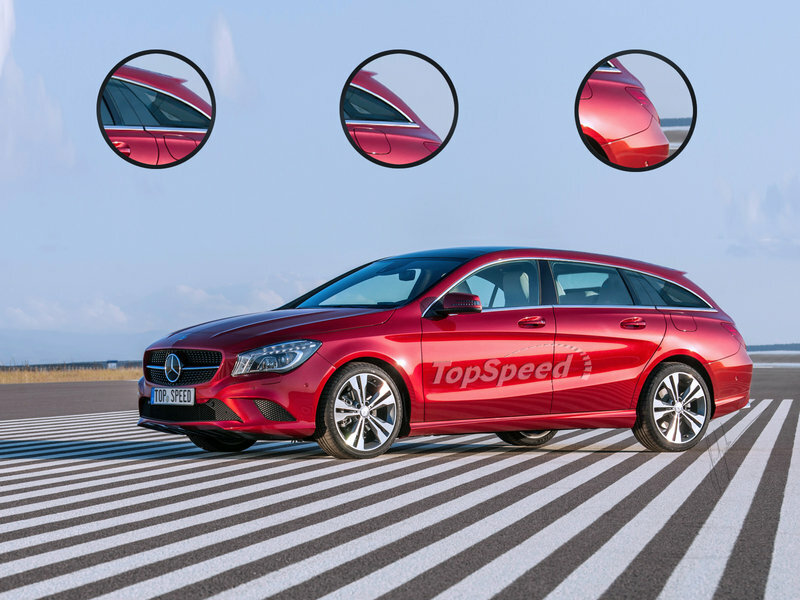 The CLA Shooting Brake, too, holds its own alongside the world champion with outstanding aerodynamics while likewise leading its segment with a Cd value of 0.26. 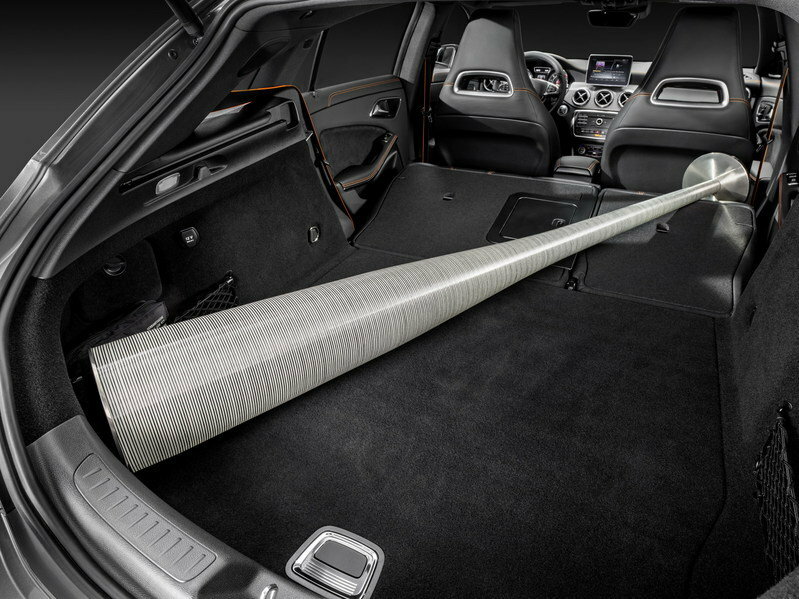 The drag area Cd x A, a decisive factor when it comes to wind resistance, is 0.57 m2 on the CLA Shooting Brake. The engine range available with the CLA Shooting Brake is extensive right from the start of sales, comprising two diesel and three petrol units. All engines impress with their agile performance, low noise levels and low emissions. The CLA 200 CDI, with an output of 100 kW (136 hp), is particularly efficient: it has a top speed of 215 km/h and a combined consumption figure of just 3.9 l/100 km, with emissions of 101 g CO2/km. All versions are equipped as standard with the ECO start/stop function and are Euro 6-compliant. All-wheel drive is likewise available straight from the market launch, initially in the CLA 250 4MATIC and CLA 250 Sport 4MATIC (features include: dynamic styling, sporty tuning of engine, accelerator and transmission as well as sporty engine sound). 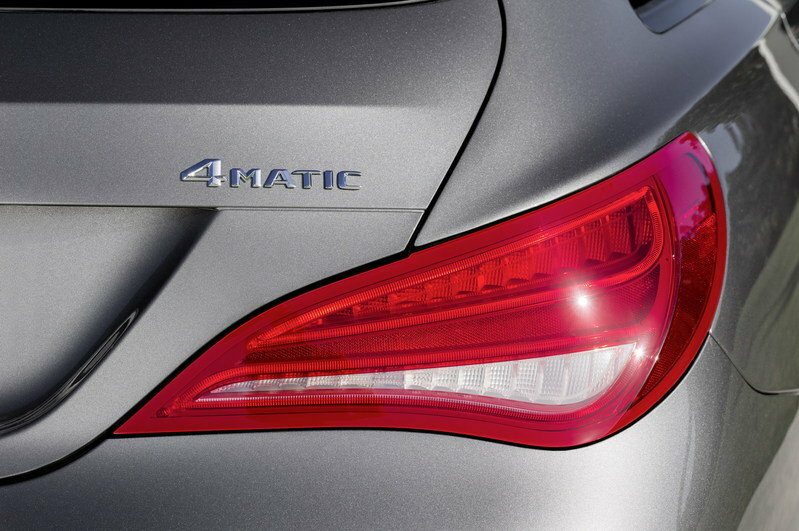 Diesel variants in the form of the CLA 200 CDI 4MATIC and CLA 220 CDI 4MATIC will follow in September 2015. Two years ago, in the form of the CLS Shooting Brake, Mercedes-Benz created a sports car such as had never been seen before: one with five seats and a large tailgate. The founders of this vehicle concept are now following it up with a smaller version, the CLA Shooting Brake - a second Shooting Brake model exuding stylish sporty flair and modern luxury, with lines that are the essence of sensual purity. Many of the detailed elements of the CLA Shooting Brake, such as its frameless side windows, appear to define it as a coupé, yet at the same time it offers the variability and practicality of an estate car. 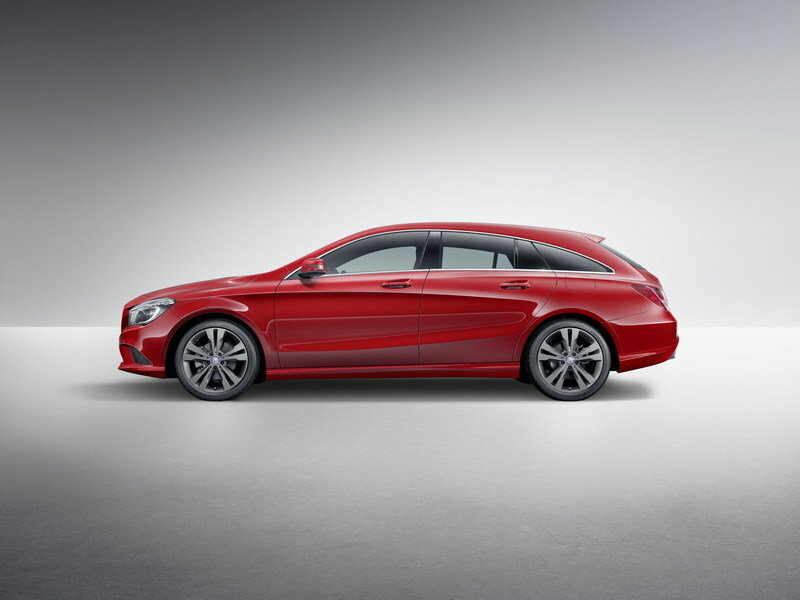 And with its long bonnet, sleek window profile with integral rear quarter window and the gentle downward slope of its roof as it flows to the rear, it demonstrates the same crouching posture as the CLS Shooting Brake. The long sweep of the roof right to the rear of the car means that it offers more headroom in the back than the four-door CLA coupé model, as well as being easier to get into. The interplay between sharply defined lines and large surface expanses gives rise to some exciting and characteristic light effects, resulting in a unique look that sets the CLA Shooting Brake quite apart from other vehicles in related segments. 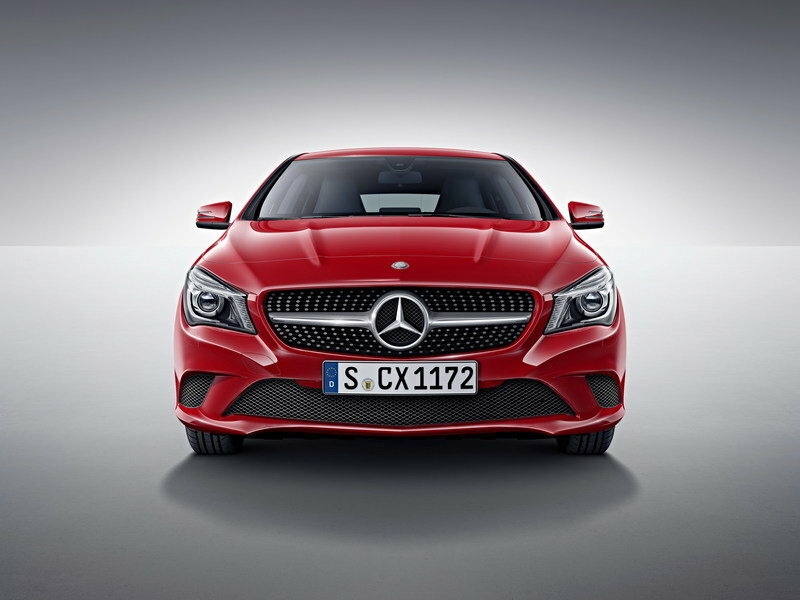 The sporty design of its front section gives the CLA its typical look. Among the striking features that contribute to this characteristic dynamic look are the powerdomes on the bonnet that are such a hallmark of Mercedes coupés, and the diamond radiator grille with central Mercedes star. 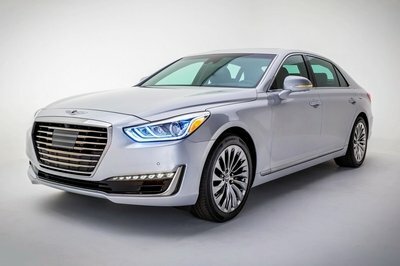 The way the bonnet is embedded into the front end makes it appear longer and, in conjunction with the upright radiator grille and the prominent V-shape of the front end, gives the car its crouching posture. The arrangement of the light modules and LED behind the headlamp lenses gives rise to the characteristic "eyebrow" effect for the daytime running lamps and indicators. 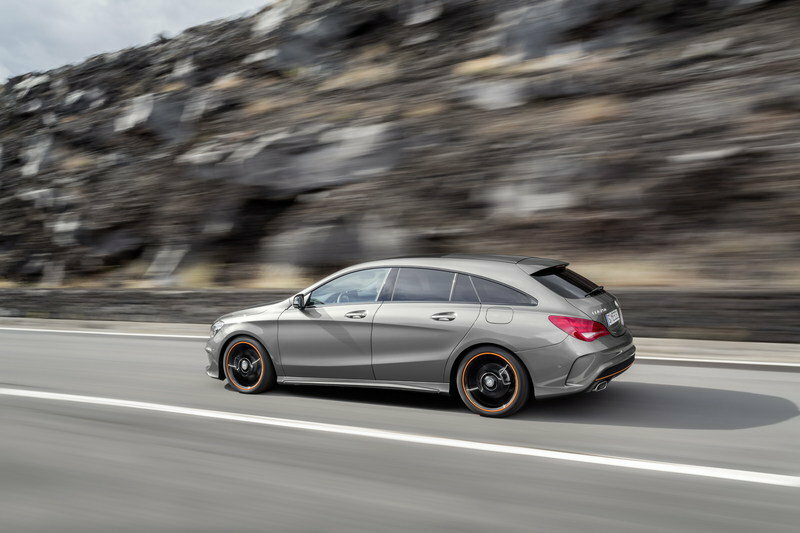 The sleek greenhouse, the elongated roof contour line, the high beltline with low side windows and an additional quarter window, plus the D-pillar that tapers towards the rear, are the particular styling elements of the CLA Shooting Brake seen in profile. Two character lines define this profile: the new, modern interpretation of the "dropping line", together with a further separate swell to the flank above the "dropping line". This supports the D-pillar, which in its turn continues the line round to the tailgate. The precise lines and three-dimensional effect of the side design create a sinewy, animated play of light and shadow. The broad emphasis of the rear end conveys a sense of power, in an interplay of tense, muscular volume and sharply defined edges. The sloping roof line, the pronounced curve of the rear window and tailgate and the distinctive look of the rear end as a whole give the CLA Shooting Brake an unmistakable flair of its own. The narrowing of the car at the D-pillars, in conjunction with the broad shoulder muscle over the rear wheel arch, adds up to a strikingly athletic look, particularly when seen from the rear. The elegant arrowhead design of the rear light clusters carries the harmonious flow of the shoulders round from the side to the rear end, the horizontal orientation serving to emphasise the powerful width of the vehicle. 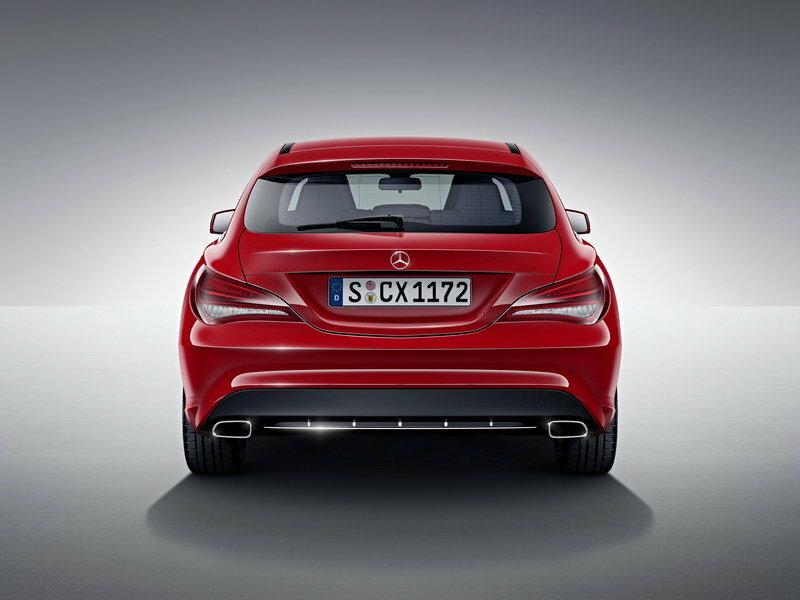 The single-piece rear light units are set neatly into the body and reflect the relationship of the CLA Shooting Brake to both the four-door Coupé model CLA and to the larger CLS Shooting Brake. The light functions are presented in an arrowhead arrangement. All aerials are integrated into the sporty roof spoiler. 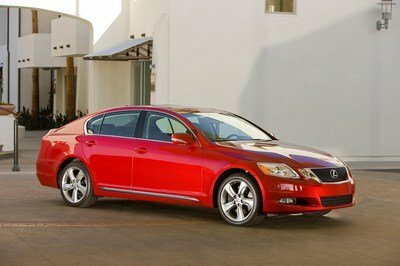 The exterior’s progressive, sporty appearance is continued inside the vehicle. The interior additionally derives a very special quality feel from the design idiom of sensual purity as well as the selection and available combinations of the materials chosen. Special equipment packages include colour-contrasted stitching. The twin-tube instrument cluster comprises two large round dials, each with a small round dial set inside it. When at rest the needles are in the 6 o’clock position. The silver-coloured needles are inlaid in red, while the dial faces feature a silver-grey textured surface. Another highlight is the new generation of 3-spoke steering wheels in different variants, including a multifunction sports steering wheel with flattened bottom section and red or black topstitching. The instrument panel incorporates five round vents. The outer rings of the round vents on all models have a high-quality silver chrome galvanised finish. The airflow direction is governed by a very neat galvanised insert that reveals a meticulous attention to detail. The CLA Shooting Brake features the latest generation of telematics systems. The free-standing display screen features a large screen diagonal of 17.8 cm (7 inches), together with a high-gloss piano-black front panel, a flush-fitting frame in Silvershadow and a fully glazed screen. Upon request in conjunction with COMAND Online, or as an option for the Audio 20 system, the display is available with an even larger screen diagonal of 20.3 cm (8 inches). The functions shown on the display combine an intuitive approach with attractive images and graphics, thus ensuring a positive user experience that adds to the exceptional design appeal of the interior as a whole. The CLA Shooting Brake in the AMG Line and Urban equipment lines is fitted with integral seats in the front and rear, underscoring its sporty character. The emphasis of the rear bench seat is on the outer seats (2+1-seater). Colour-coordinated contrasting topstitching is available based on the chosen equipment. The ambient lighting system encompasses a total of 13 light sources in the interior, among them a light in the opening between the head restraint and the backrest. The ambient lighting system is available as an option with different colours: any of twelve colour schemes can be selected to suit taste and mood, helping to conjure up an individual atmosphere in the interior. The thrilling design details of the limited-edition OrangeArt Edition special model ensure that it brings an exciting note to the market launch. Orange trim in conjunction with selected equipment features, such as the AMG Line and Night package, emphasise the sporty flair of this model. A distinctive sporty look is also ensured by 45.7 cm (18-inch) AMG multi-spoke light-alloy wheels, painted in black with an orange rim flange, together with orange highlights on the front and rear aprons. The bi-xenon headlamps feature orange highlight rings. 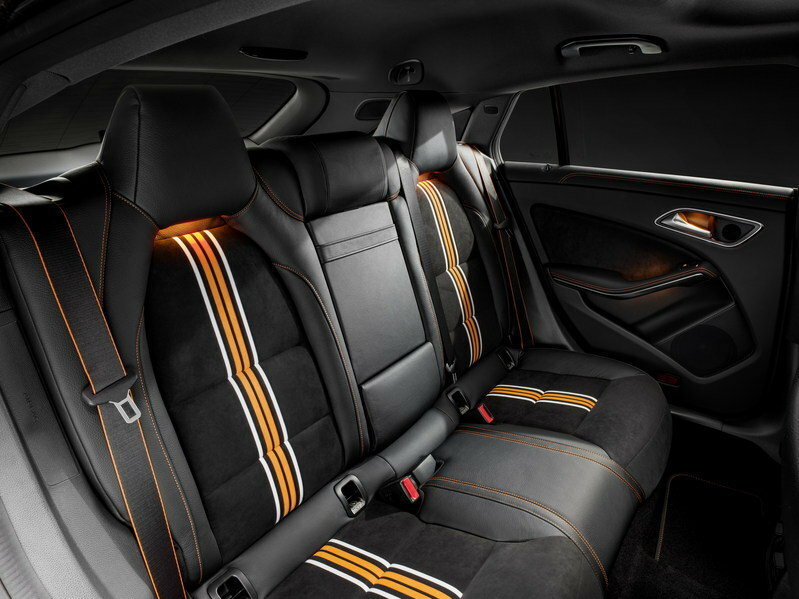 The interior, too, is imbued with a sense of exclusive dynamism, thanks to the Exclusive package, sports seats with leather/DINAMICA microfibre upholstery in black/orange and orange contrasting topstitching, along with black seat belts with accentuating orange stripes. The 3-spoke multifunction sports steering wheel in leather, the instrument panel in ARTICO man-made leather and the aluminium trim with honeycomb-pattern grain, as well as fine detailing such as the recurring orange contrasting topstitching in the interior, convey a sense of delight in the unusual. The CLA Shooting Brake is also available with either of the two equipment lines Urban and AMG Line, in each case with numerous line-specific details for both the exterior and interior. The AMG Line augments the sportiness and exclusivity of the CLA Shooting Brake. This equipment line includes a more dynamic exterior with AMG bodystyling, 45.7 cm (18-inch) AMG 5-twin-spoke light-alloy wheels and a two-pipe exhaust system with chrome-plated tailpipe trim. The interior also exudes a sporty flair, with sports seats in ARTICO man-made leather/DINAMICA microfibre, a multifunction sports steering wheel with flattened bottom section and a leather-upholstered shift lever. 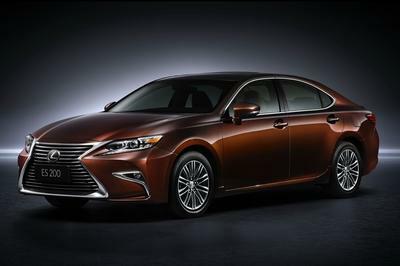 The lowered sports suspension enhances handling as well as driving enjoyment. The Urban equipment line uses selected exterior and interior equipment and appointment features in a similar way to emphasise the vehicle’s dynamic appeal, whilst also allowing further individualisation. Dynamic highlights of the exterior include a diamond radiator grille with high-gloss black pins, the 45.7 cm (18-inch) 5-twin-spoke light-alloy wheels and the two-pipe exhaust system with chrome-plated tailpipe trim. Contributing to the sporty character in the interior are the sports seats with contrasting topstitching, a multifunction leather steering wheel with perforated grip area and a wave-look trim element. The optional panoramic sliding sunroof with its large glazed area provides for an especially bright and friendly ambience in the interior. It comprises an electrically operated glass sliding roof for individual ventilation of the interior, together with a mesh wind deflector. This reduces both draughts and wind noise when the roof is open. Accident researchers at Mercedes-Benz have recently calculated that COLLISION PREVENTION ASSIST PLUS could cut the number of serious rear-end collisions by up to 30 percent compared with vehicles that do not have a corresponding protective system. For their prognosis, the safety experts used figures from Germany’s Federal Statistical Office to assess how effective standard-fit COLLISION PREVENTION ASSIST has been in the B-Class to date and simulated digital accident data. 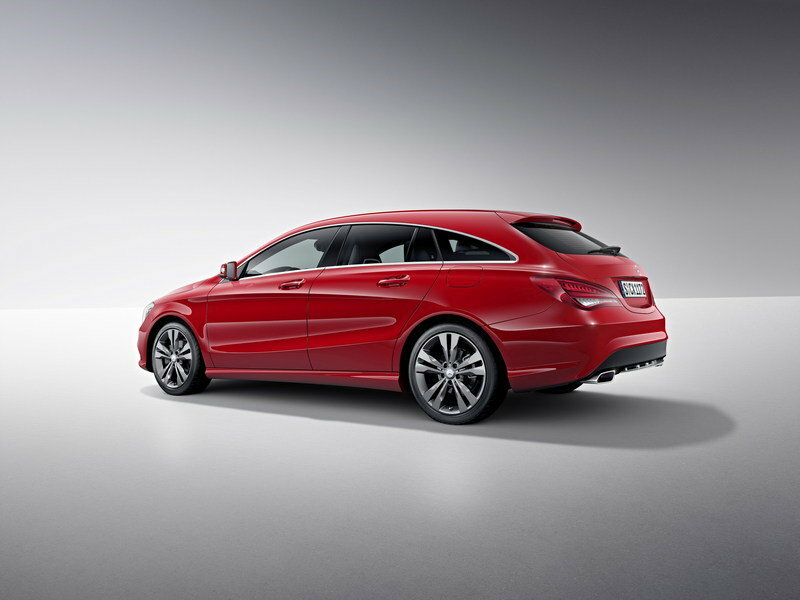 The CLA Shooting Brake features COLLISION PREVENTION ASSIST PLUS as standard. This assistance system extends the functionality of COLLISION PREVENTION ASSIST by the addition of autonomous braking to reduce the risk of rear-end collisions. If the driver fails to act when a risk of collision is detected, despite the warning lamp in the instrument cluster and the intermittent audible alert, the system will automatically trigger braking. The vehicle speed is thus already significantly reduced. Depending on the relative speed, this intervention may be enough to avoid a rear-end collision with vehicles that are driving more slowly, stopping or stationary, or significantly mitigate its severity. Also fitted as standard is the drowsiness detection system ATTENTION ASSIST. Operating within an extended speed range (60 - 200 km/h), it uses a five-stage bar display to visualise the driver’s current attention level. "Mercedes connect me" connects the CLA Shooting Brake with the world around it. The communications module, which is available as standard in certain European countries, makes it possible to use the Mercedes connect me range of Standard Services. Available services include, for example, Accident Recovery, Maintenance Management and Breakdown Management. In an accident, the Mercedes-Benz emergency call system automatically connects the occupants with the Mercedes-Benz Emergency Call Centre and sends the position and condition of the vehicle to the rescue operations centre. A rescue vehicle can then be dispatched immediately. The system works automatically, but can also be triggered manually. The optionally available Remote Online facility allows the customer to connect to their vehicle from anywhere and at any time via "connect.mercedes.me" and, for example, to use their smartphone to find out how full the tank is. 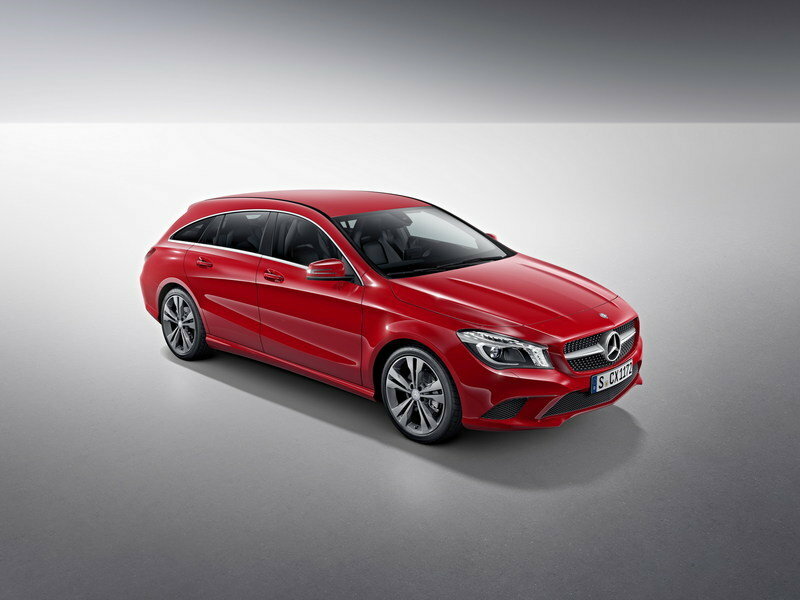 The new CLA Shooting Brake is the fifth member to join the Mercedes-Benz compact car family. And what a successful family it is: with a total of 375,000 A-, B-, CLA- and GLA-Class vehicles, more compact models than ever before were sold in the first ten months of 2014. More than a fifth of the compact cars built by Mercedes-Benz stay in Germany, with Great Britain and Italy the next-largest markets. The introduction of the new compact car models has seen the Mercedes-Benz brand become palpably younger in appeal - around the world, the average age of its customers has fallen. Around the world, some 900,000 vehicles of the new generation of compact models are now in customer hands, including 100,000 CLA models. The conquest sales rate for the CLA worldwide stands at around 50 percent. The CLA Shooting Brake is built at the company’s plant in Kecskémet, Hungary.